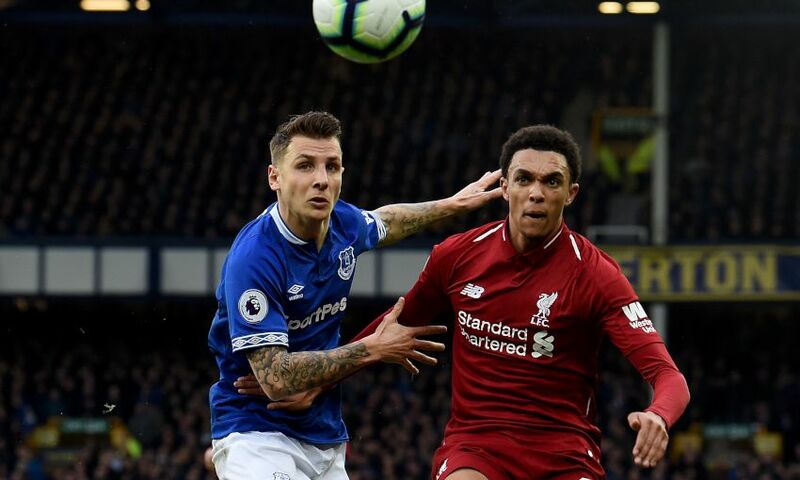 The 233rd Merseyside derby ended in goalless stalemate as Liverpool and Everton drew a blank at Goodison Park on Sunday evening. The Reds’ most promising moments during a match short on real chances came in two clear sights of goal for Mohamed Salah, in either half, but the Egyptian was denied on both occasions. And Jürgen Klopp’s side therefore remain second in the Premier League, a point behind Manchester City with nine fixtures remaining this season. Klopp made a single change from the 5-0 win over Watford in midweek, Jordan Henderson replacing James Milner – who had felt a hamstring in the days before the match – in the line-up. Sadio Mane continued in a central role with Divock Origi stationed on the left-hand side of the Liverpool attack once again. Roberto Firmino was fit to take a place among the substitutes. Greeted by an atmosphere befitting any Merseyside derby, not least one with connotations for the Premier League title race, the Blues began with intent. Bernard broke free on the left flank and sent a dangerous cross into the box that a succession of Everton players attacked but could not connect with. Liverpool threatened from a similar situation when Henderson intelligently stepped into space from the right side and lofted in a ball neither Origi or Georginio Wijnaldum could control at close range. The Reds were unable to find their fluid best in the opening half-hour but they did fashion two excellent opportunities for Salah to strike. The first was mostly of the Egyptian’s own making, his agility in possession taking him past Lucas Digne 20 yards out, but his attempted curler was too close to Jordan Pickford. Then, on 28 minutes, they got Salah clean through. Fabinho was the creator with a perfect curving pass from the middle into his unmarked teammate’s run in the right channel and the No.11 had time to pick his spot – only for Pickford to match his low shot with a vital save. Liverpool were steadily taking control of the game, sweeping up Everton’s attempts to trouble on the counter-attack, but without a moment of true quality. And so the relatively tepid first half concluded goalless. 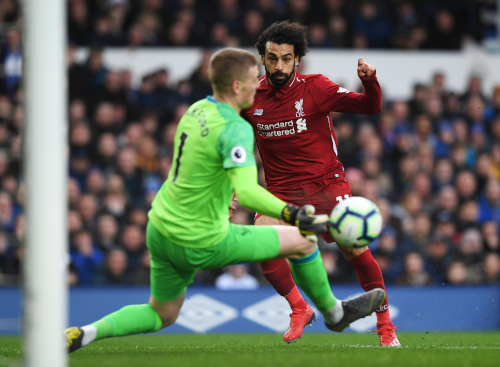 There was greater energy to the second half from the off and Dominic Calvert-Lewin drew a save from Alisson Becker when he nodded Digne’s corner towards the left of the net. But, after Origi guided a low effort wide, the Reds got Salah into another clear goalscoring opportunity on 56 minutes, with Joel Matip the architect via a snaking run forward from deep. His eventual knock through found Salah with room to drive in diagonally and train his aim – but Blues centre-back Michael Keane recovered brilliantly to block his opponent with a sliding tackle. Klopp made a double substitution within moments of the hour mark, Firmino and Milner replacing Origi and Wijnaldum respectively. And Liverpool grew in assertiveness, a neat routine on 69 minutes seeing Andy Robertson’s chip over the Blues backline directed across goal by Virgil van Dijk to Fabinho, whose chance to prod in was denied by Digne’s timely interception at the far post. Despite glimpses at either end in the final exchanges, however, neither team could find a winner and it was a point apiece for the Merseyside rivals.